Lowdown: The pictures behind the development of the Mass Effect universe. What is it, exactly, that allows the Mona Lisa to be perceived as highly as it does? I am no expert and I do not know the answer there, but I can testify for my own taste and sense of appreciation. I can claim to prefer science fiction / fantasy inspired art much more than the classics. It's stuff that may not be hung at a museum, protected by safety glass, but it’s much more exciting. If, like me, you are moved by such art, and if, like me, you are a fan of the Mass Effect universe and everything that goes with it, then The Art of the Mass Effect Universe may be right up your street. 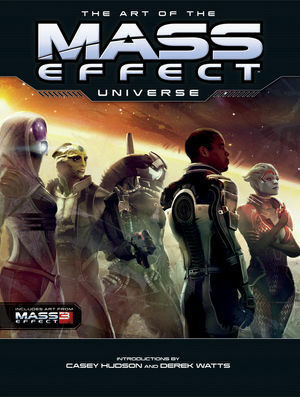 This coffee table book, released a month prior to the release of the Mass Effect 3 game, is divided to three parts – one for each of the series’ games. Each game’s section includes some cool poster like action images, mostly featuring its heroes and villains. While nice, I find the rest even better: using pictures and a bit of text, the book tells us how each of the building blocks of the Mass Effect universe was developed and often why. We see the thinking behind the Turian body, what Krogans look like without their suits, and how the colors of Shepard’s armor were determined. We even see glimpses into what Tali might look like with her mask off. The result is an impressive collection of impressive artwork with a story for those who want to listen and learn. Overall: Obviously, The Art of the Mass Effect Universe has very limited appeal to outsiders. Insiders should find it an interesting read, a colourful browse, and a lovely piece of memorabilia. 4 out of 5 stars.